As of yesterday, I am 35 weeks. Which means that you, little one, will show up in the next five weeks or so. It’s hard to believe. This pregnancy has not seemed short, like so many people say. It’s been one of the most intense eight months of my life, for so many reasons, not least of which is the constant awareness of you. Your father has been just extraordinary. His care of me, and his care of you, is something so powerful and sweet that I hardly know how to process it. He just left for three days and without him I feel adrift. Luckily, I have you, and I have a host of things to do to prepare our home (and my brain) for your arrival so I’m not too worried about filling the time. I may be totally wrong about this, but I feel as though I already have a sense of your personality. You are going to be one active, curious kid, and you are going to be a handful. But you are also going to be game, ready for most anything, and I think, even, adaptable. You aren’t going to be an anxiety monger like your parents – somehow you will figure out that there’s just no need. This is what I know to be true of you now, so, when you are eighteen we’ll just have to decide if any of it sticks. You move ALL THE TIME. You kick, you roll, you do a ton of stretching. You have explored every inch of the small cavity you fill and you continue to take what you need to keep growing strong. You are a miracle. I’m awed by the extra crazy love you inspire in my friends and family. We had a baby shower a couple of weekends ago that included a bunch of our family being here – including your grandma! – and it was a completely glorious long weekend. Uncle Ian and Aunt Tessa built all of your nursery furniture. Uncle Steve did a zillion errands. Grandma made cheesecake and couldn’t stop rubbing your little home in my belly. And about twenty close friends came over to raise a glass of wine to you and share their advice on parenting. I hope that somewhere in your hind brain, you are aware of all of this, and aware of the veritable ocean of love you swim in every day. So, now you have the hiccups, which you generally get 3-5 times a day. 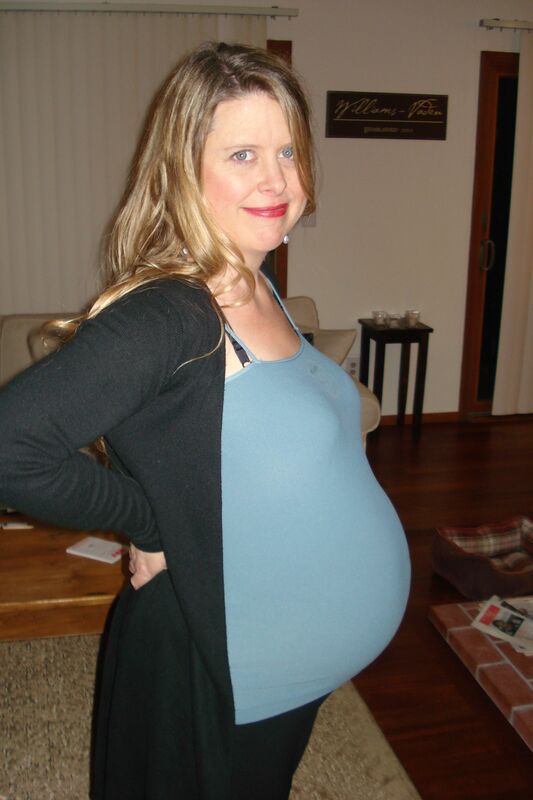 With how much my belly bounces, I can only imagine how much your whole body must shudder with every spasm. But it means that I need to stretch out cuz the only way to calm you down is to give you more room. So I’ll put my computer down for now, and lay down, and give you whatever it is you need to keep cooking in there for the next few weeks. There’s no rush, my love, as much as you seem to be ready to tackle the world. Give your lungs the chance to develop even more, get fatter. The adventure starts soon enough. WOW you look sooooo beautiful! Thanks for posting something, since your brother is writing about basketball (yeah, I know that matters to those UNC types!) Good luck with the little one. He probably *will* tackle the world! Those hiccups continue after they’re born too. My neighbor just went to the hospital this morning to have her first baby. She was due 1/30, so she’s a bit late. She’s 39 years old, like me. Yay for older mommies! Sorry to make another comment…I just read Ian’s entry and got tears in my eyes. That’s so beautiful. And you look so radiant post-birth! He’s a perfect baby with a perfect name. Congrats!